I don't talk about it much on my blog, but I am a member of the Church of Jesus Christ of Latter-day Saints. My religious beliefs mean a lot to me and I try to pass them on to my kids as best as I can. In my church children are baptized at the age of 8, and I have been looking forward to Danny's baptism since he was a baby. 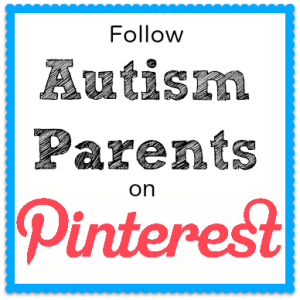 Of course, when he was a baby, I had no idea that Danny had autism and that this would make many aspects of his life difficult for him. We have talked about baptism with the kids often, and in the past, Danny always seemed excited at the prospect of his 8th birthday and subsequent baptism. Around January, we discussed it more specifically in reference to him being baptized in July. His reaction surprised me. Danny broke down crying, which is very atypical of him. When I pressed him for reasons, he just got frustrated with me and spouted some gibberish. I had no idea whatsoever what was causing his angst. After this episode any time anyone mentioned the word "baptism" Danny would cry and storm out of the room. I prayed about it and agonized over it. What was causing his tears? Was he not ready for this step? What should I do? I decided to drop the subject. Obviously, for whatever reason, he wasn't ready. I knew if I kept pursuing the topic I would just be causing more anxiety and frustration for him. So we would give him time and space and just see what happened. The problem was, my daughter continued to bring up the subject, repeatedly. As soon as the word "baptism" was uttered, I would frantically launch into damage control mode, murmuring reassurances to Danny while focusing my stink eye with laser like precision at Charlotte. I told her to stop talking about it, but that just seemed to make it worse. And no matter how much I reassured Danny that he didn't have to get baptized, he would still break down, crying. After each episode I was even more confused about the source of his angst. One night when Danny was enjoying a bath, Charlotte yet again mentioned baptism. While I tried not to lose my temper with Charlotte, I noticed that Danny was not crying. I decided to take advantage of this rare calm and ask him cautiously why the mention of baptism bothered him so much. Danny looked me in the eye and said that he was scared to be dunked under the water. I was flabbergasted. Not about the water, because that seemed like a very reasonable fear. No, what astounded me was that he had so clearly and directly communicated his fears to me. This is not a normal occurrence for Danny. So often his feelings seem to muck up his communication and the more upset/excited/happy/angry he might be, the more difficulty he has retrieving words. Another surprise was that once Danny told me about his fear of dunking, he continued to play calmly in the bath. No tears, no anger, and no stomping off. He didn't even repeat his catchphrase, "Mom, I just don't want to talk about it!" I was disappointed that Danny's baptism would have to be postponed indefinitely, and I wondered if he'd ever be ready to take that spiritual step. But I was ecstatic at his ability to communicate his feelings to me. It felt like a major accomplishment, one I cherished and mulled over for weeks to come. Two months later, after attending the baptism of a friend, Danny approached me and announced, "I should be getting baptized soon. I want to get baptized!" Excited, but wary, I let the subject drop for the moment, fearing that Danny had just been swept up in his friend's festivities. But the next day, Danny insisted that he wanted to get baptized too. Typically, people invite most of the church members and all their family members to these functions, which end up being pretty big and lively parties. Bil and I had already decided we would simplify Danny's baptism service and shorten it in keeping with Dan's attention span. When I asked him who he wanted to invite, Danny was surprisingly definite. Aside from his grandparents and aunt, Danny only wanted to invite one family from church. My vision had been a big party after the baptism, full of all my friends, all the people who have been part of our lives here: the kids' Sunday school teachers, their babysitters, my good friends. But, that was not to be. Instead, I had to inform all those people that they were not invited to the baptism. Because this is Danny's day and he should have it exactly how he wants it. I cannot begin to explain how much all of this means to me. I am, of course, thrilled that he has decided to get baptized. I want him to have a relationship with God and would love for him to stay active in our church. But there's more than that. I am so excited that Danny was able to express his fears to me. I am also delighted that Danny had such a definite opinion on who he wanted to attend the baptism. He made several comments that told me that he is beginning to understand his limits sensory-wise. He recognized that a small group would be much more enjoyable for him and so he stood his ground. I am really proud of him. And I am excited and hopeful for the future. If Danny was able to express his fears in this incident, who knows what the future will hold? Baptism is symbolic of a new birth, spiritually speaking, and I can't think of a more apt analogy to what has been happening with Danny in other areas of his life. For whatever reason, in the last several months, a new Danny has been emerging, a kid who is opening up to me, showing me a side of himself I have rarely been privy to. He has been sharing his feelings and snuggling with me, conversing with his sister and demonstrating unprecedented levels of empathy. For the first time in his life, my son has told me he loves me all on his own! It feels like I am getting to know a whole other layer of this amazing, fantastic kid, a side I have only seen glimpses of in the past. And I am loving every minute of it! I have always been one of those goody two-shoes who follows all the rules. It's not so much because I believe in the rules. It's more that I have this fear of getting caught, of rocking the boat, of somehow getting in trouble. I never once ditched school as a teen, because I was so afraid of getting caught. Now that I am older, I still follow the rules, mostly. I show up when I say I'll be somewhere. I am an upstanding citizen--my speeding tendencies notwithstanding. I knew when I had kids that my family would have rules. I would teach my kids to follow those rules, just as my parents taught me. In fact, I assumed most of my parents' rules would become mine once I had kids. For example, I always assumed my kids would eat what I made for dinner. No way would I be one of those schmucks who makes several meals, trying to please each of her kids. No short order cook for me. Yeah, the laugh's on me. 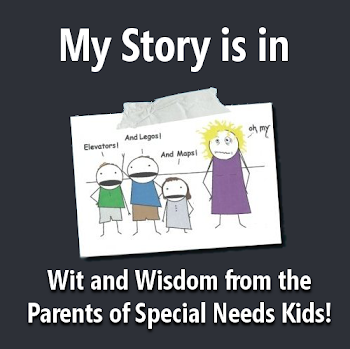 Now I have kids--kids with SPD--and many of my childhood rules just don't work for my family. I guess you could say my kids have taught me to loosen up and break the rules from time to time. 1) Don't wear pajamas in public. PJs: they're not just for sleeping anymore! Danny would live in his pajamas if he could. 2) No more monkeys jumping on the bed. Jumping on the bed is a family sport. All in the name of getting in that good deep pressure. 3) No playing with your food. Get it? Playing with your food? See, he's playing with canned food. Oh, alright, not as funny as I thought. Mud. Mother Nature's perfect toy! 5) Sleep in your bed. 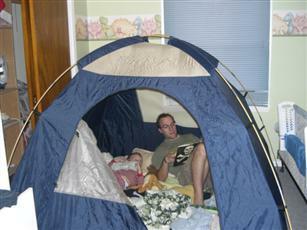 Truth be told, I don't remember the last time my kids slept in their beds. Beds are for suckers. Tents = way more fun, especially when chock full of blankets and stuffed animals. 6) No swinging, playing ball, riding a bike or roughhousing in the house. That includes trampoline jumping, of course! Swings, glorious, swings! Our house is so popular with the neighborhood kids. And ever since we discovered my son has SPD, rough housing has become one of our favorite family pastimes. Who says Sensory Processing Disorder can't be fun? How about you? What 'rules' get disregarded in your home for the sake of well-regulated senses? Instead, we made up our very first picture schedule illustrating all the steps we needed to take to get to the pool. We added in pictures representing breaks and leaving, and we showed Danny that if he cooperated when we left, he would be rewarded with a Baby Einstein video. 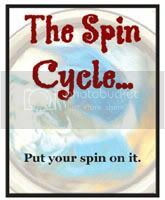 For more posts on "firsts" check out the Spin Cycle, sponsored by the wonderful Jen over at Sprite's Keeper. I've been a bit stressed lately. Stressed about Danny's school situation (he's struggling with learning and getting decent grades and focusing), stressed about Tommy (who screams dozens and dozens of times a day. I wonder if this is a behavior problem or something more sinister, like the "A" word), and stressed about money and how to make it stretch just a bit further. Tommy got filthy rolling around in the dirt with his Thomas trains. This outing was hugely successful and full of tons of popcorn, lemon shakeups and ice cream. And it was worth every dime we spent to spend some time together that involved no therapy, no homework and no worries about autism or SPD! Click here for more posts about family life. Chalk Line opens with Chief of Detectives, Ben Gallagher picking his younger brother up from prison after a 10-year stay. The same day, the brothers discover the body of Dayton Slaughter, their lifelong family friend and father figure. Before he can be dismissed from the case because of his personal involvement, Ben races to solve the mystery. As Ben struggles to unravel the mystery of who murdered Dayton, he uncovers more questions than answers--questions that could rock his family to its core. Ben is conflicted between his determination to protect his family and his desire to find the killer of the only father he's ever known. The investigation takes Ben into his family's past and across state lines, as he searches for information. There are many twists and turns as Ben tries to get those close to him to divulge information pertinent to the case. Ben suspects someone close to him might be responsible for the crime and he struggles with his responsibility as a detective and his duty for his family. 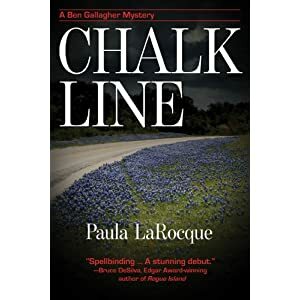 Chalk Line has a distinct film noir feel to it, reminding me of some of the great classic detective movies, like Laura and Bogart's Maltese Falcon, though the book is set in modern times. LaRocque's debut novel is one that is intelligent and suspenseful. It is also exceptionally well written with complex, interesting, and believable characters. If you like detective novels with smart and colorful characters and fantastic writing, Chalk Line is the book for you! We had a really, really horrible morning today. It started off great; everyone woke up a bit early, so I had plenty of time to make lunches, feed kids breakfast, and even snuggle with the kids. Then all hell broke loose and Charlotte just lost it. Completely and utterly lost it. And to be honest, so did I. She was still crying when I pulled up to her school, and she wouldn't leave the van. She kept saying she would miss me and she wanted to stay home. Charlotte adores school. The only reason for her outburst was that I had yelled at her this morning. Like I said, we had a really bad morning, one where because Charlotte wouldn't get dressed, we were running late. Not that this excuses my yelling, but I've seriously been at my wits' end with Tommy. I have no extra patience left over for anything the other two might throw at me. So, I left Charlotte at school crying and wailing that she wanted to stay with me. And I cried the whole way to the gas station. As I drove, I spotted two women walking together, obviously enjoying the beautiful weather and the chance to socialize while exercising. A wave of envy washed over me, and it was so powerful it almost morphed into hatred. At that moment, I would have given almost anything to be so unencumbered by kids as these two women. And to see others enjoy a privilege that I so desperately longed for made me very angry at the women, though strangers to me. My feelings shocked me. I try very hard not to entertain feelings of envy or jealousy. Why allow myself to long for things others have? That just leaves me feeling bitter and angry. And I hate that victim mentality. It does nothing but alienate others and leave you miserable. Besides, I have plenty of wonderful things in my life, things to be grateful for. Still, this morning as I drove around, I was overcome with feelings of envy and anger towards so many nameless, faceless people. I hated those who had easy kids, kids who had no problems in school or in socializing, kids who didn't melt down because I made them change clothes into something more appropriate for the weather. I hated people who got time off from their kids every single day. The parents who are wealthy enough to employ a nanny even though the mom stays home? Yeah, I hated them. People who regularly get breaks because they have family or friends nearby who watch their kids? Yep, angry at them. Those who have so much money they don't know what to do with it when I am worried about how to pay for important therapy for the kids? So resentful of them. Families who have never even heard the words "autism" or "Sensory Processing Disorder" uttered except maybe on a public service announcement? Can't stand them. I know my anger is misplaced. And I really feel uncomfortable with these feelings. Because if the truth be told, I'm not really angry at all those people in the world who supposedly have things easier than me. No, I'm angry at myself. I hate that I yelled at Charlotte and upset her so much this morning. I hate that I spanked Tommy yesterday because I just couldn't stand the screaming one more minute. I hate that I just can't seem to handle anything anymore. It frustrates me that I never have anything left over for Bil by the end of the day, and I feel terrible that I have become so resentful of adults who want or need anything from me. I have nothing left to give anyone, not even myself. I never wanted to become one of those bitter women who spend all their time wishing their lives were different, all the while missing the blessings staring them in the face. But it looks like I'm starting to become that very woman. 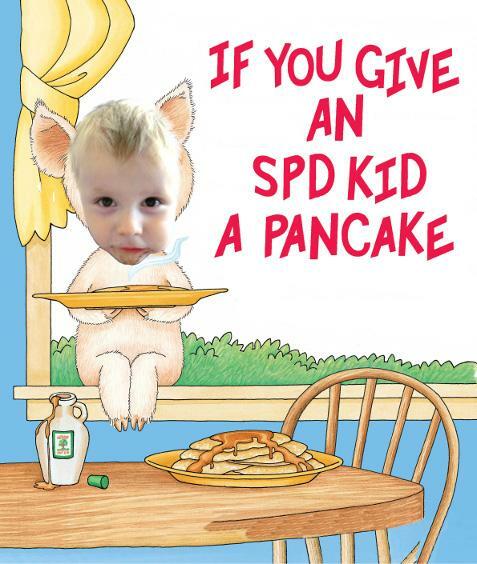 If you give an SPD kid a pancake, he'll probably ask you for some syrup to go with it. When you give him the syrup, he might spill some on the table and begin playing with it. When you see the mess he has made all over the table, you'll realize that he needs some tactile input, so you'll pull out your stash of dry rice and beans. You'll have to wash his hands so he doesn't get everything all sticky. He will scream bloody murder when you wipe his mouth and hands. After covering your floor in beans and rice he might break into your cabinets when you're not looking and pour an entire box of cornstarch on the floor. While dancing in the cornstarch, he will raise up clouds that will impair your vision. This is when you might decide he needs to play in the sandbox, so you'll have to take him to the park. At the park, he'll accidentally sit in a puddle and will scream until you manage to locate some extra pants for him to wear. When you change his pants, he might want to run around naked for a while, even though you say he can't. As you try to catch him, you might notice other parents giving you nasty looks. Those nasty looks will be repeated when your kiddo runs into some kids to get some deep pressure. It feels good to him, so he doesn't understand why the kid he ran into is crying. Next, your SPD kid will decide that he wants to go on the merry-go-round, but as soon as someone pushes it and it starts spinning, he'll fling himself off and bloody his knees. Once you clean him up, he'll probably head to the swings. Swinging for upwards of a half hour should calm him down. As it's nearing lunchtime, you will warn your SPD kid that it's almost time to head home for lunch. You might give him warnings at 15, 10 and 5 minutes, but he will still probably act surprised when it's time to leave. He may throw a tantrum and refuse to get in the car. Bribing him with extra computer time might get him to cooperate. Then again, it might not. By this time, you're probably worn out, so you decide to get lunch from a fast food joint. Once inside McDonald's your SPD kid might freak out and cover his ears when the timer for the French fries goes off. As you proceed to your table, he might accidentally bump into other tables because of his poor body awareness. Once at your booth, he will probably have to be reminded to sit on his bottom a few dozen times. Instead, he will repeatedly stand on his seat and jump. If you happened to order him the wrong number of chicken nuggets or the wrong drink, you can bet all hell will break loose. Because it's so loud and distracting at the restaurant, he probably won't eat a whole lot, and most likely you will wonder why you didn't just go through the drive thru. When you finally get home, exhausted, you will plop him in front of a Thomas the Train video so you can have a minute's rest. When you hear him jumping on the couch, you rouse yourself to turn off the TV. You realize it is almost time for therapy, so you start to get him ready to leave. Since your SPD kid didn't eat much lunch, he will declare that he is hungry. You offer him every snack you can think of: applesauce through a straw, pretzels, apples and popcorn for crunching, but he insists on a pancake--the only thing your kid has willingly and happily eaten all week long. 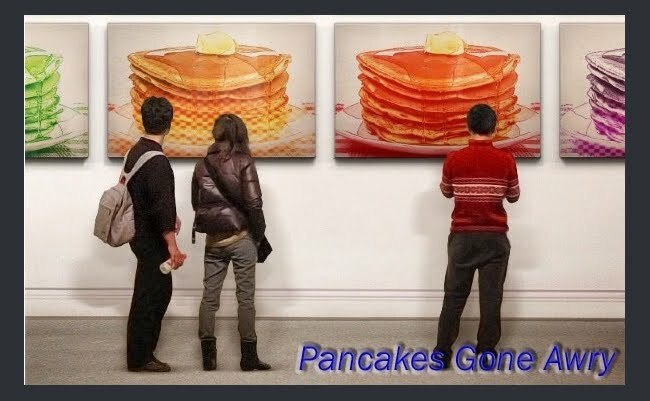 he'll probably ask for some syrup to go with it.